I was in high school and living at home when my older sister was diagnosed with cancer. My sister and her husband moved in with my parents to help take care of her during her treatments and my mom quickly became an expert on all things healthy. My mother had always been careful about what food she brought into our house. She never bought store-brought bread, it was always homemade whole wheat. She never bought candy or treats, so we had to resort to sneaking left over hot cocoa mix from a camping trip into a glass of milk or cookie dough. But when Charity got cancer she became even more diligent and interested in what foods and vitamins should be in our diet. She bought a juicer and started buying carrots in bulk and growing her own wheatgrass. 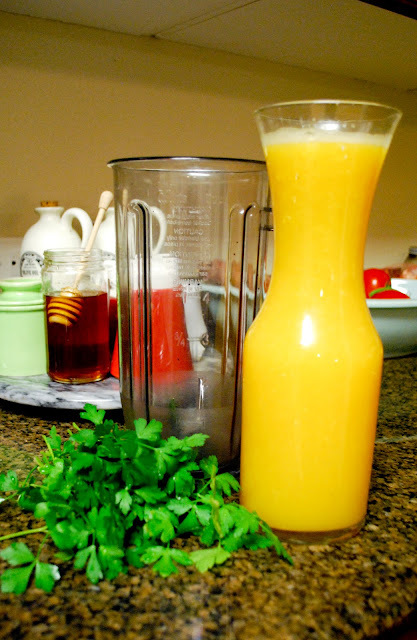 I do love carrot juice but I have to say that my mom's concoction of parsley and orange juice was my favorite. Now, you probably think of parsley as a garnish but from my mother's research I learned that parsley is the ninja herb. It is full of oils that can help detoxify cancerous chemicals. It also has vitamin C, vitamin K, vitamin A, beta-carotene, folic acid, (and it helps with bad breath if you remember this movie). This is very simple and extremely refreshing. Just try it. It's always a struggle to get people to take a sip but then they always agree that it tastes like orange juice - duh. I happened to have a TON of oranges so I fresh squeezed the OJ and I used parsley I had grown myself so it was especially delicious this time. All I do is wash a bunch of flat-leaf (or Italian parsley) and roughly chop. 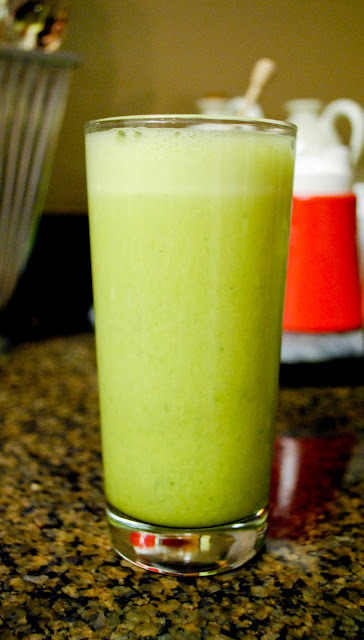 Put it in a blender and fill with orange juice (I usually fill almost to the top). Blend for several minutes until bright green and smooth(ish). I like it right out of the blender but you might want to pour it through a fine sieve and serve it with ice if you're not into drinks with texture. Enjoy (and reduce your risk of cancer too)! One more thing for my pregnant friends. I've read that eating large doses of parsley can induce uterine contractions so beware of that . . . unless you're over 38 weeks and then I say drink away! First of all, 'ninja' is one of my all time favorite words! I use it almost daily. For example "you kids clean your room ninja fast and we'll watch a movie". It can be used in so many random ways. I love it! Second of all, this post made my mouth water. My childhood consisted of daily juice making fun. My all time favorite is carrot, apple, parsley. I will be trying this parsley-orange soon! I killed off my herb garden so I'll need to plant some more. I can't WAIT to try it! this sounds heavenly! I've adapted a Giada recipe for citrus salsa verde over salmon (I use tilapia), and one of the best flavor groupings in the salsa is the fresh orange with parsley. thanks for sharing! Wow, I was not prepared to click on that link. What an incredibly personal and touching story of your sister's passing. I have tears in my eyes and my mother's heart aches along with yours knowing that your sister had to leave her child behind. How do you and everyone in your family continue to top your amazingness the more I learn about you. Your mom NEVER bought homemade bread? Seriously? You need to tell me one of her faults (and one of yours too) one of these days so I can stop feeling so bad about myself! Love your blog and watching your adorable son grow. Seems like just yesterday our 25 year old son was just his size! Love the drink recipe. We are doing all we can to eat better at our house. One more caution about parsley. If you are breastfeeding, it can dry up your milk--so choose another green until you are done nursing.